Traditionally installers have not had an antenna mast to use to install transmitters or any type of antennas. They had to use the existing light pole where they encountered difficulties because the pole sometimes blocks part of the signal, especially for an omni-directional antenna. Most of these antennas are designed to quickly mount on a small 1″ – 2″ mast, and it is a challenge to adapt them to other mounting scenarios. Providing a mast and getting these antennas in free air with no blocking structure, is an advantage that speeds installations and increases height and signal coverage. That is where StrongPoles is committed to providing additional options for these devices, the Top Mount Mast and 8×10 Mounting Platform Mast (or Birdhouse Mast). The Top Mount Mast is constructed with 1-1/2” aluminum tubing and attaches to the top of any 4” Strong Pole via a 4” square plate that is 1/4” thick and is fastened with four 5/8” bolts (provided). This 30” high mast is tall enough for the most massive parabolic antennas, multiple patch antennas if needed, or one or more Yagi antennas. The 8X10 Mounting Platform Mast (or Birdhouse Mast), is also constructed with 1-1/2” aluminum tubing and attaches with four bolts or self-driller screws to the blank side of the 8X10 Mounting Platform (Birdhouse) via two 1-1/2” x 4” aluminum straps that are 1/4” thick. This mast is 39” long and rises 29” above the edge of the Mounting Platform it attaches to. This mast can also hold the most massive parabolic antennas, multiple patch antennas if needed, or one or more Yagi antennas. 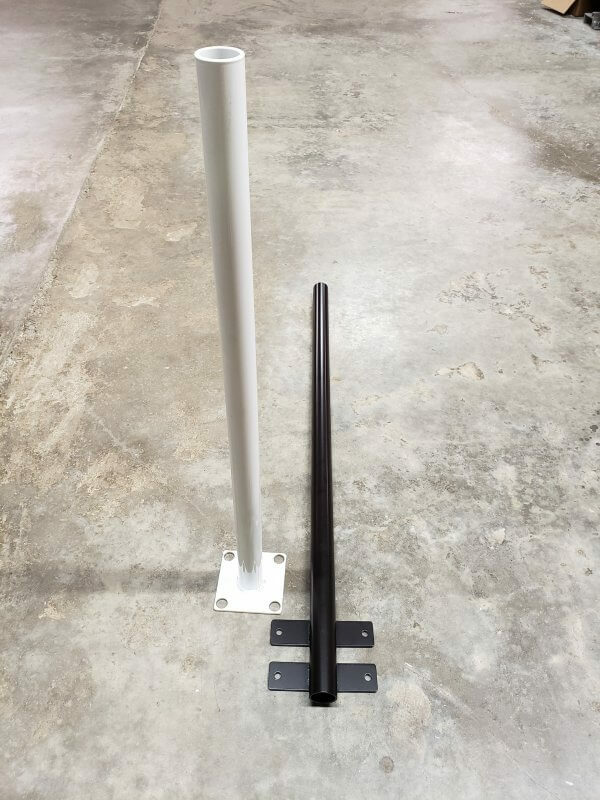 For more information on our antenna mast mounts, please contact one of our Sales Engineers here at StrongPoles toll -free 844-669-3537 or stop by our website. This entry was posted in Blog and tagged Bolt-On Masts. Stylish bolt-on mounts for pendant mount Pan Tilt Zoom and Panoramic cameras.